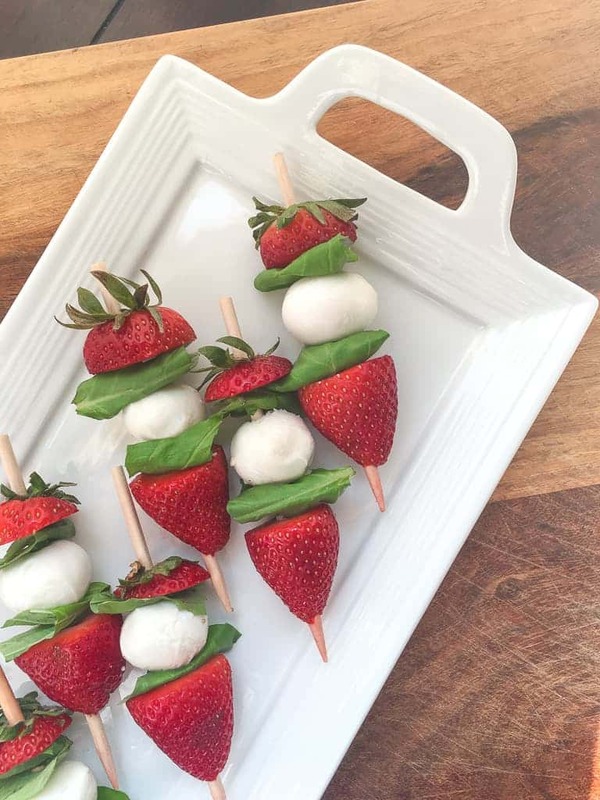 April is the beginning of strawberry season and what better way to celebrate red, juicy strawberries than with this delicious, creative recipe for Strawberry Caprese Skewers with Balsamic Glaze. This recipe is an unexpected, delectable variation of the traditional Caprese salad that replaces the classic tomato with strawberries which pair beautifully with the rich balsamic glaze and fresh basil. The weather is going to be warming up soon, which means people will come out of winter hibernation and will begin socializing and entertaining again! 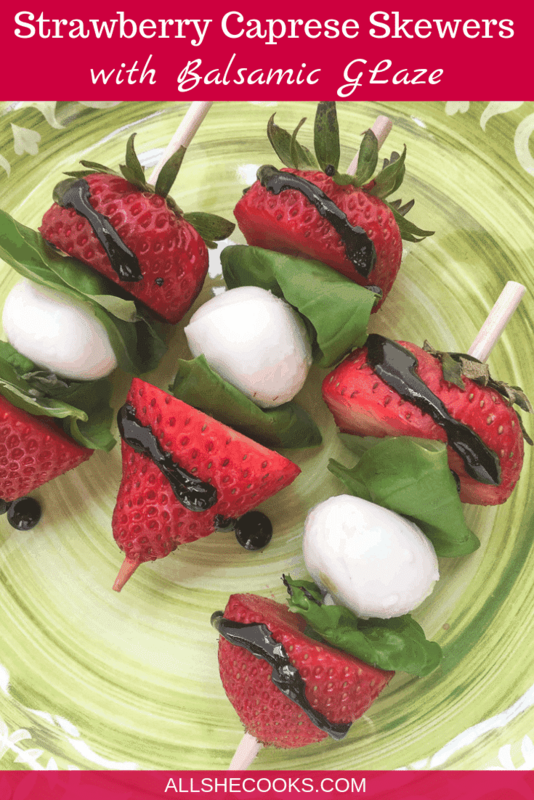 This delicious Strawberry Caprese Skewers with Balsamic Glaze recipe is the perfect quick and easy treat for spring and summer entertaining. Serve them as an appetizer or as a quick and beautiful snack. Everyone will rave about how amazing they are! Not only are these skewers delicious, but they make such a beautiful presentation! Just looking at them makes you think of warm weather and spring. The bright red strawberries “pop” against the white mozzarella and the deep green basil. They are almost too pretty to eat…almost. Substituting red, juicy strawberries for tomatoes is a unique and fun twist on a classic. This variation on a classic recipe provides just enough sweetness that when paired with the balsamic glaze creates that irresistible sweet & slightly salty flavor. Kind of like the salted caramel of appetizers. One thing is for sure, if you bring these flavorful beauties to your next get-together, you will be carrying home an empty plate. Additionally, this delicious Strawberry Caprese Skewers with Balsamic Glaze recipe is light and refreshing. Perfect for warmer weather or for those who want “just a little something” to enjoy before a meal. They won’t weigh you down! They’ll just perfectly prepare your palate for what comes next. Step #1: Thread the top half of one strawberry onto a wooden skewer with the hull facing up. Step #2: Next, fold one basil leaf in half, dark side facing out, and add it to the skewer. Step #3: Add one mini-Mozzarella ball, followed by another folded basil leaf, and then the bottom half of the strawberry. Step #4: Repeat with the remaining strawberries, basil, and Mozzarella until you have 16 completed skewers. 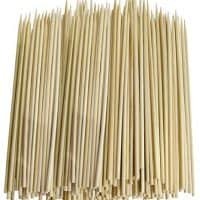 Step #5: Arrange skewers on a serving platter and set aside. Step #6: Prepare the glaze by adding balsamic vinegar to a small sauté pan over medium-high heat. Cook, stirring frequently until the vinegar is reduced to about 1/3 of its original volume. Step #7: Remove glaze from heat and let cool slightly. Drizzle over the skewers, along with some extra virgin olive oil, if desired. Tip: The warm balsamic glaze will start to melt the cheese on contact. For a cleaner presentation, avoid adding the glaze to the cheese while drizzling it onto the skewers. 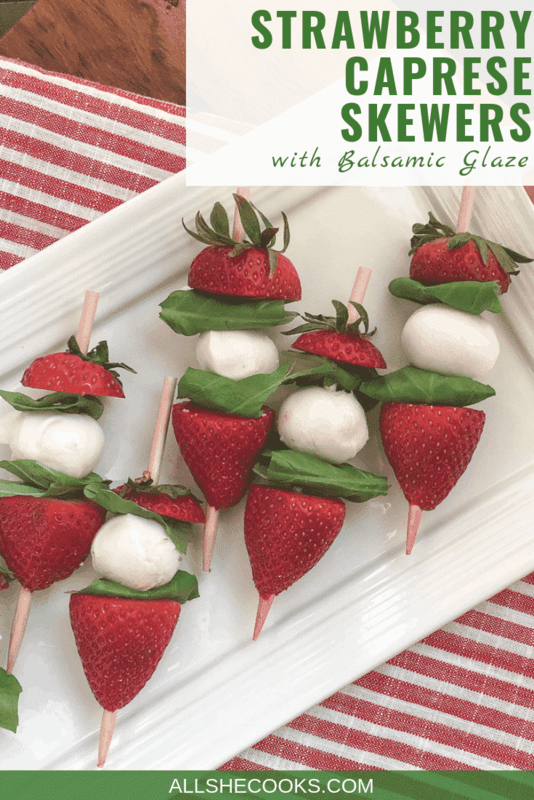 This Strawberry Caprese Skewers with Balsamic Glaze recipe is a delicious, light vegetarian appetizer recipe that is a perfect summer recipe idea. Thread the top half of one strawberry onto a wooden skewer with the hull facing up. Next, fold one basil leaf in half, dark side facing out, and add it to the skewer. Add one mini-Mozzarella ball, followed by another folded basil leaf, and then the bottom half of the strawberry. Repeat with the remaining strawberries, basil, and Mozzarella until you have 16 completed skewers. Arrange skewers on a serving platter and set aside. 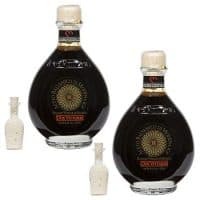 Prepare the glaze by adding balsamic vinegar to a small sauté pan over medium-high heat. Cook, stirring frequently, until the vinegar is reduced to about 1/3 of its original volume. Remove glaze from heat and let cool slightly. Drizzle over the skewers, along with some extra virgin olive oil, if desired.